Ise Worshipping Shiki Tour (四季の旅・お伊勢参り) is one of the most popular tourism in the history of Japan. Ise is located in Mie Prefecture. Ise is very far from Tokyo, but Shiki Bus Tour make it very easy for travelers. This tour has all famous tourist spots including the Grand Shrines of Ise. To have a lot of time in Ise, the bus leaves at night at Shinjuku Station and arrive in Ise in the morning. You will enjoy great Sunrise from the rocks. After the worshipping, you can enjoy shopping at Okage Yokocho. Type: Over night shrine tour. Access15 min. from Shinjuku Station West Entrance.Check out the meeting location. Popularly known as "O-Ise-san," or officially"Jingu," Ise Jingu is principally composed of the Kotai Jingu and Toyoukedai Jingu, where the supreme deity Amaterasu Omikami and the great deity Toyouke Omikami are worshiped, respectively. In addition, Jingu also includes fourteen auxiliary sanctuaries, as well as one hundred and nine lesser sanctuaries, including sessha, massha and shokansha in which are generally located facilities for the preparation of sacred food and textile offerings. Originally, Amaterasu Omikami was revered within the Imperial palace by successive Japanese Emperors. However, in the era of the tenth Emperor Shoji, in awe of the divine authority of Amaterasu Omikami, the august mirror, the symbol of the god, was moved from the Imperial palace. After searching in other regions, finally in the twenty-six years of the reign of Emperor Suinin (4 B.C. ), she decided upon the present sanctuary of Nakaku, by the upper Isuzu river, as the place where Amaterasu Omikami should be enshrined for eternity. This tour takes you the most famous and strong Power Spots, the grand shrines of Ise very easily in reasonable price. We leave Shinjuku at night and stay overnight in the bus. So, it it one day tour to travel very far side of Japan, yet, you still have a lots time to enjoy the grand shrines of Ise. It arrives in the morning before the sunrise. The famous marrige rocks will have a beautiful sunrise between the rocks in early summer. They have two drivers for the safe ride and one guide to take you around the spots of Ise. Safe driving is the most important concerning for this tour. There are many ladies who join this tour by themselves. The seat will be paired with the same gender. It is only from 9800 JPY for all the spots of Ise. It is the once in the life time tour. 1. 9800 JPY for Monday and Wedensday tour, and the day before the weekend and holiday is 11980 JPY. 2. 2 drivers for safe long drive. 3. Enjoying Sunrise from marrige rocks. 4. There are two shrines of the grand shrines of Ise. The manner is worshipping from the outer shrine first. 5. 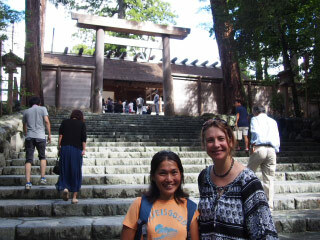 Then visiting the inner shrine. 6. free time at Okage Yokocho Shopping district and Oharai Machi Street. 7. Also visit Tsukuyomigu Shrine. It is the top secondery shrine of Ise..
8. In the option, it also visit Sarutahiko shrine for bringing good luck. 9. The bus has wider seat for confortable bus ride. 23:00 Bus leave to Ise. Sleep in the bus. Morning before the sunrise at Futamigaura and Meoto Iwa, the marriage Rocks. 40 min. The outer shrine for 60 min. The inner shrine and Okage Yokocho and Oharaimachi street for 240 min. 20:30 Back to Shinjuku Station.